Apples for Children 5 out of 5 based on 18 ratings. 18 user reviews. –Where are all the kids? I’m walking up to the second floor of the Krasnyy Lug children’s dormitory. It’s pitch black and I can’t see anything. I look into a room in which only one small bulb is lit. A whole bunch of kids is running around, and one can hear every possible type of cough–from the dry to the most moist and dull. The kids are keeping busy. Some are drawing, others are pulling others by the hair, yet others are just talking. I sneak up and try to take a photo, but the treacherous flash spooks everyone. –I remember you. Did you bring us ice cream? The little boy is not shy in the slightest. He walks right up to me and looks up with a look of curiosity. –No, they’d kill me if I brought ice cream. Another one walks up to me and pulls at the edge of my coat. Inna Vladimirovna, a young and pretty teacher, walks into the room. –Could I give them a few corn chips? –No way! It’s time for supper. They won’t eat anything. It’s always like that. No matter what time we come, it’s always either lunch or dinner. The sound of cough reverberates through the room. –Try not to catch it! As I wandered, the older kids helped my Zhenyas and Lena unload the food and other goods which we delivered to the orphanage. –Could I at least give them apples? 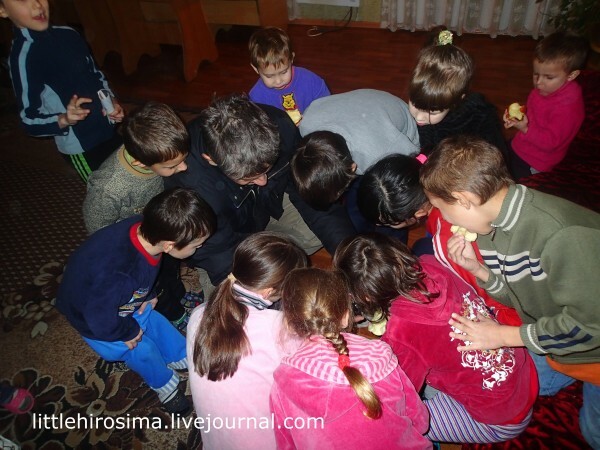 The kids totally enveloped me while I was distributing the apples. 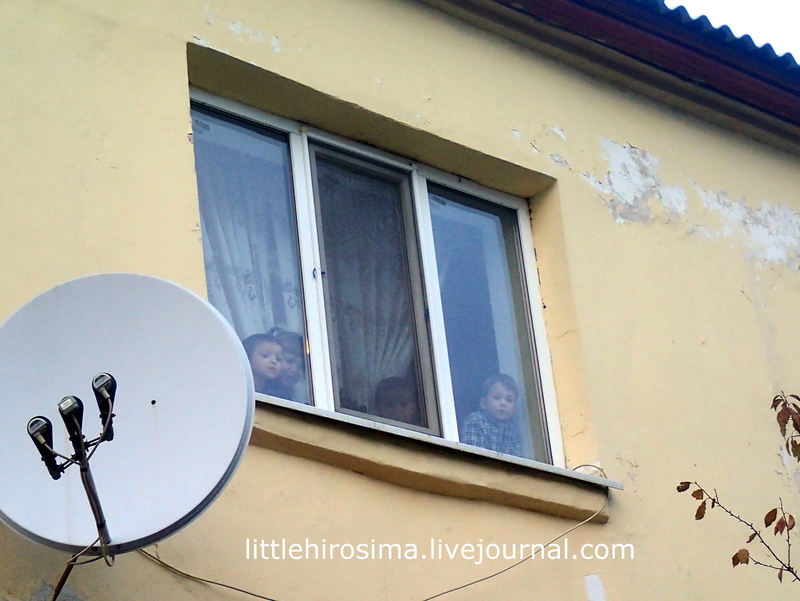 While apples were disappearing, heads appeared in the second floor window. A minute later all of them were glued to the window. The teachers and nurses started to laugh. Many of the kids who were here in the summer were gone. It’s not quite an orphanage. It’s a dormitory where parents in difficult circumstances leave their kids. 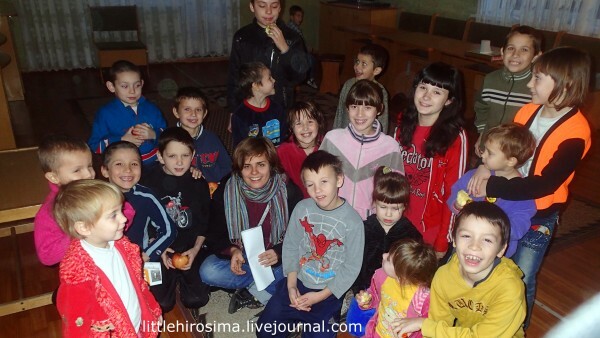 Some of the kids who were here in the summer were taken back by their parents. 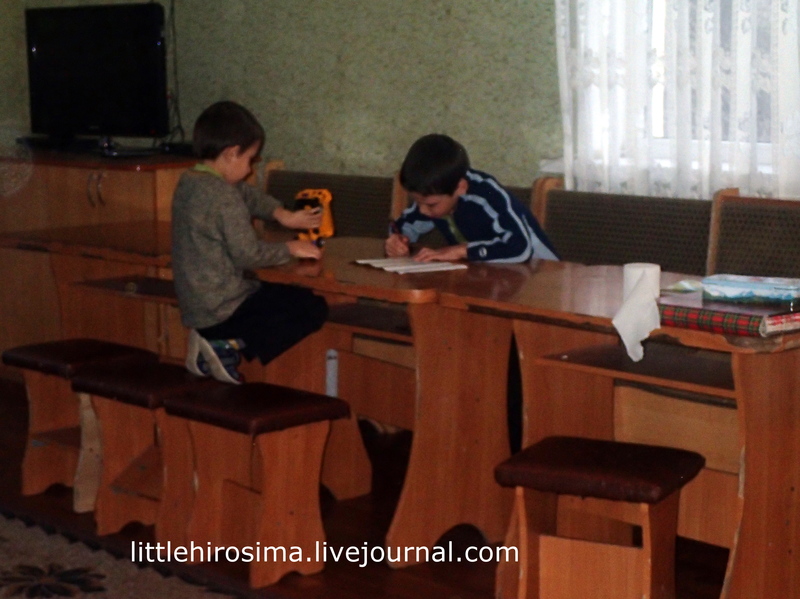 The dorm is not too big–about 20 kids. There are orphans, and kids whose parents lost parenting rights. But there are also many who are delivered here for the weekdays and go home on the weekends. –They are well fed and warm here. They are being cared for. There are different cases here. 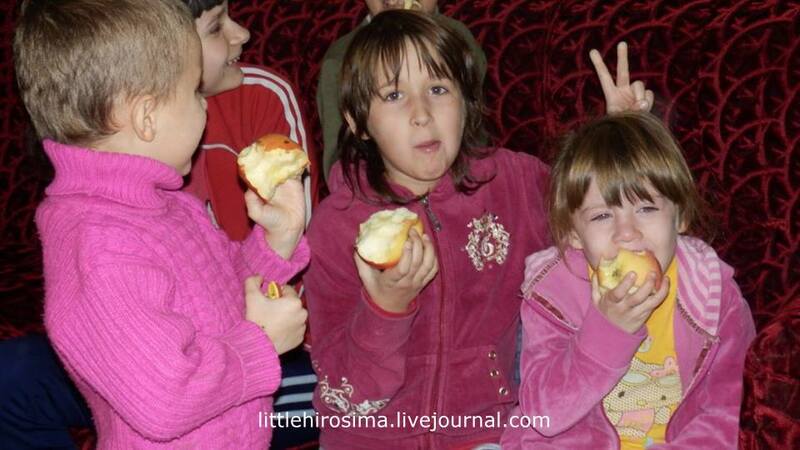 Humanitarian aid is being regularly delivered to orphanages and retirement homes. But there’s a general problem with vegetables, dairy products, and meat. I’ve written about it many times, but the situation has not changed. 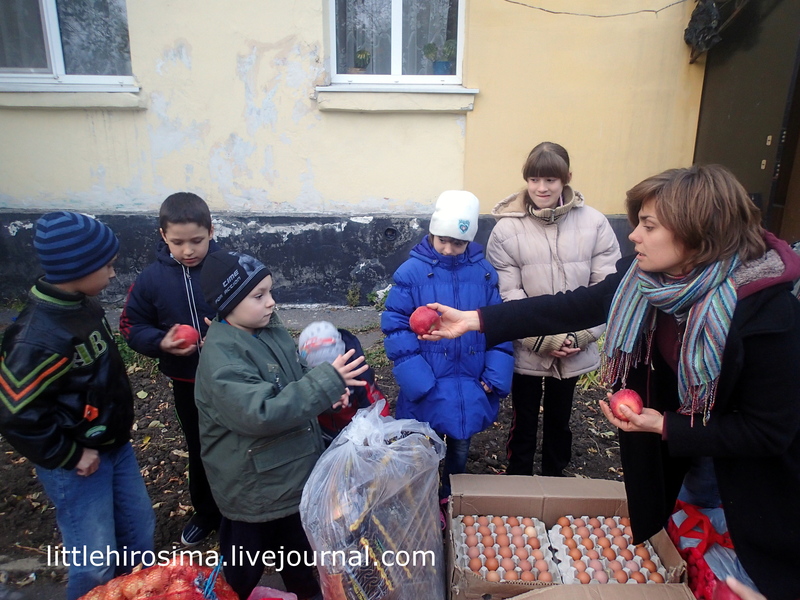 Moreover, Donbass children suffer from a deficit of vitamins. It’s not something synthetic tablets alone can solve. It’s the cold time of the year, and they need balanced nutrition. Not just canned meat and groats, which is what the official aid mainly consists of. Which is what the republics have been living on for over a year. 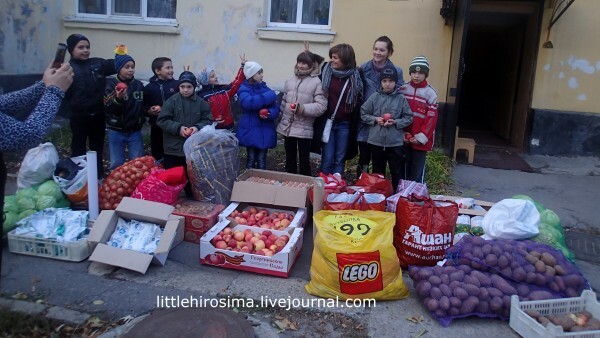 After the photo we went up stairs to give apples to the sick. Once again I was surrounded. –What kind of camera is that? Can we see photos? This really got the kids excited. –You can take photos underwater? Cool! Show us! –I’d need at least a bathtub. But I’ll show you. Then Zhenya came in, and things really started happening. At first everyone started to pose. Girls were making funny “adult” poses, boys were making faces and making hand gestures which were considered fashionable among them. Then there was the obligatory collective viewing. –Of course–because who else would bring you apples? And lamps. Can’t forget about the lamps.